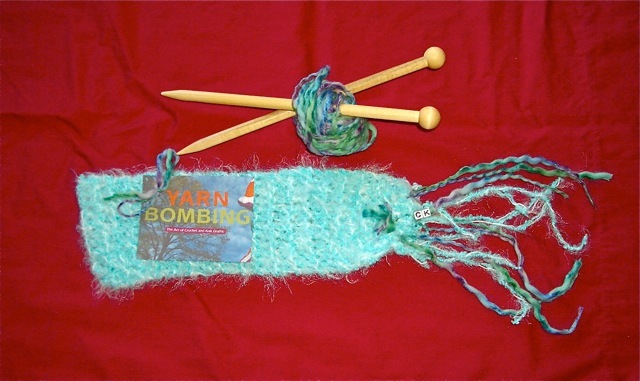 I have combined my love for fiber arts with photography…I am a yarnbomber! http://yarnbombing.com The whole idea of the activity is to decorate an inanimate object without harming it and leave without being observed! Some lucky individual will eventually remove the handmade fiberwork and take it home for their own! We never know who! I love this blog!!! Kathy, I ‘d love to see you knit something with Apso hair! Debby and Vickie, did you save Dante’s long locks, or just that one? And Kathy, when did you “dress” the sculpture? In the dark of night? You could crochet, macrame, weave friendship bracelets–any type of handmade fiber craft will work! Go for it! 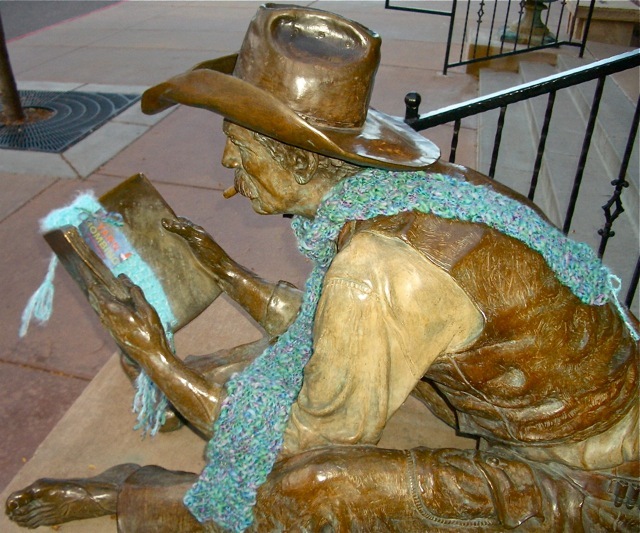 The literary cowboy got his scarf and bookmark at dawn. The knitting was gone later that same day. I have my eye on a cute little dog sculpture that definitely could use a red fuzzy collar! Katy, Dante’s locks were earmared for donation to ExcessAccess.com, which is making booms (human & pet hair stuffed into nylons) for use in the Gulf soaking up BP oil. So Kathy, how big would the needles have to be to make the squares that went around this tree? And what kind of yarns would work? Would it have to be wool so it wouldn’t stretch too far and fall down???? Use extra large needles…17 or so. And man (woman!) made yarn/not wool or animal fiber. Just have fun and play! Share a photo of your tree bark in coat!! Thanks, Kathy. I’m so glad I asked, because my intuition on this one was absolutely wrong. I was thinking I was gonna have to use wools so they wouldn’t stretch and fall off….So much for MY intuition….Guess I can use up a few drawers full of fancy scarf yarns that never morphed into scarves….